The value of the goods stolen in a break-in has gone up – hardly a surprise, with the number of computers and portable electronic items we all own. Break-ins can also have devastating effects on the individuals and familes that have been robbed. Leaving them feeling violated and a loss of sense of safety. In the summer, break-ins are more common, as there is simply more opportunity. Every other home on a street may be empty over a long weekend, making it easy for thieves to target their activities. While monitored alarm systems are a definite detriment, keep in mind that a thief can generally grab what he is interested in long before the police arrive. Locking windows and doors is the most important thing you can do to stop a break-in. Up to 40% of residential break-ins happen without the use of force. Always lock the deadbolt and make sure that locks on patio and sliding doors are strong enough to withstand kicks. If your garage is attached to your home, lock the door leading to the inside – even if your garage door is down, it’s easy to open. Don’t inadvertently advertise that you are going to be away on vacation. Telling all your Facebook friends that you are headed off on a three-week trip to Europe may seem like a good idea, at least make sure your profile is somewhat private (or that you haven’t “friended” people you don’t really know). When you do leave town, don’t advertise it. Have a friend housesit, or make arrangements for someone to pick up the mail and the flyers. If you are going to be away for more than a few days, think about getting the lawn cut as well (it will make your return a lot less depressing as well). Know your neighbours. Whether it’s in the form of neighbourhood watch or the less formal activity of knowing who lives on your floor in your apartment building, if you recognize the people who live around you, you’ll recognize someone who doesn’t fit in. And, likewise, if your neighbours know you, they will notice if someone they don’t know is walking off with all your electronics. Remember, break-ins frequently happen during the day when people are at work. Don’t leave that spare key outside, “hidden”. It’s hardly hidden if someone sees you retrieving it, and it’s a lot smarter to leave a set of keys with a friend or family member who can rescue you in case you lose your keys. 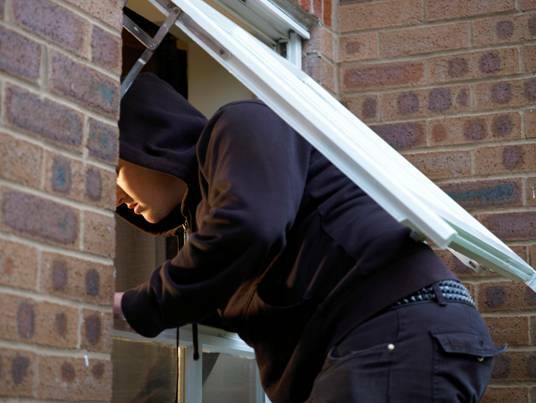 Burglars are far less likely to break in if they think someone is home. It’s pretty simple to make it seem like someone is home – leave the music or television on, as well as a light or two. If you have a yard, install motion sensitive lights, which will flash on and deter unwanted visitors. When you buy a new flat screen TV, don’t leave the box out in the recycling bin. Otherwise, you are advertising to anyone who looks that there is something new and cool to steal. Likewise, don’t leave the drapes and blinds wide open when you are out to let people see just what wonderful stuff you have. Put your purchases in the trunk of your car, if possible. It’s much harder to break into. If you don’t have a car trunk, keep any parcels hidden, maybe under a blanket. And avoid making trips to your car from the mall, and back again. Even if you’ve hidden the gifts, the thief has seen you put them in the car! Never leave your purse or cell phone lying on the seat while you run in for one last thing. These are visible and tempting. An expert thief can break into a car in seconds. Don’t leave your car running, even if you’re just popping into the local corner store for some milk. Remember, it only takes a few seconds for a car thief to break in, and a running car is very attractive! Park where it’s well lit, with lots of traffic, as opposed to a secluded dark area. Need I say more? Use no-name reusable shopping bags, if they’re going to be visible in the car. If a potential thief sees “Holt Renfrew” or “Apple” on the bags, it’s a definite temptation. Take all your gifts in the house when you get home. Leaving them in the car might keep them safe from your kids, but not from thieves. Maybe you can leave them with your neighbour until you can safely sneak them in the house. It counts as a claim against your home insurance, your premiums may go up at renewal. You have to pay your deductible. The standard deductible these days is $1,000. You have to start shopping all over again before Christmas so no one’s left disappointed. Not only that, but if the thieves have done any damage to your car, that’s another claim with your car insurance company, and another deductible to pay. Taking a few precautions will help you to have a happy holiday season. For more information, or to get a quote a home insurance quote, contact Square One at 1.855.331.6933.